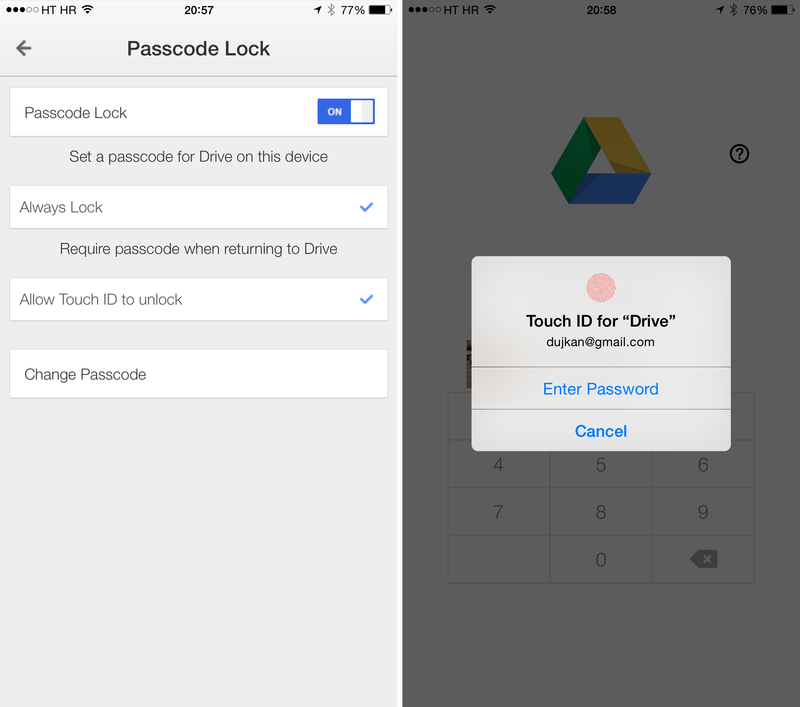 Following up on a recent Google Drive update which brought out support for Touch ID fingerprint verification and iPhone 6 resolutions along with a brand new Share extension to access cloud files in almost any iOS 8 app, today the search giant Google announced that it’s now possible to send files to your Drive from other iPhone and iPad applications that have advertised their storage extension system-wide. And in addition to the usual slew of bug fixes and performance improvements, the refreshed Drive client for iOS now makes it possible to view and share custom maps through the company’s My Maps feature. The app would previously support uploading photos and videos only from the iOS Camera roll, making it difficult to, say, upload a file from Dropbox without resorting to a tedious, multi-step procedure involving multiple apps. This kind of nonsense is now behind us. On both the iPhone and iPad, you can now upload files from other apps. To get started, fire up Google Drive on your iOS device and tap the plus sign in the upper right corner. Now choose the new ‘Upload Files’ option which produces a menu populated with the installed storage providers. A quick backgrounder: any iOS 8 app can optionally expose its local documents or cloud-based storage to the system, thereby making them easily accessible from within other apps. In fact, many popular apps have already done so, including the likes of Dropbox, Microsoft’s OneDrive and Readdle’s productivity apps. I’ll just go ahead and choose Dropbox. 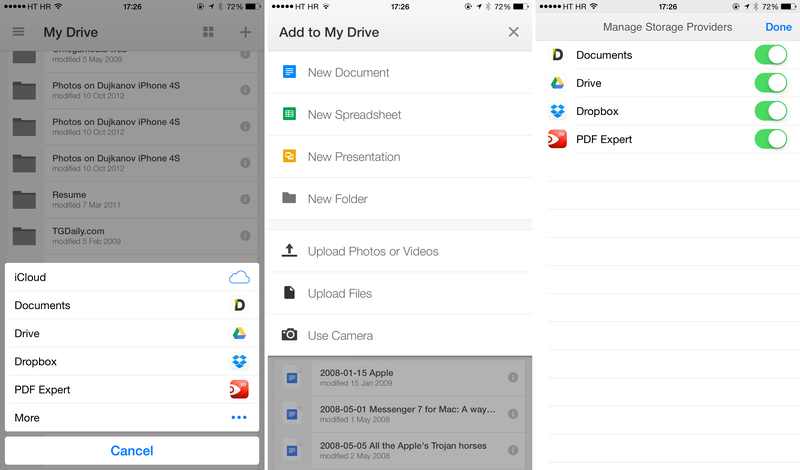 Voilà, up pops Dropbox’s own interface — nested right inside the Google Drive app. Tapping on a file automatically slides down Dropbox’s interface and prompts the Drive app to begin uploading newly-chosen content to Google’s cloud-storage service. Pretty remarkable, when you think of it. This is why Apple has made the right move opening up previously walled off parts of iOS. It’s in situations like this that power users really start to appreciate extensions and the many ways inter-app communication in iOS 8 makes them a whole lot more productive. As a nice little bonus, both Android and iOS editions of Google Drive can now access and share custom maps created with Google’s My Maps service, which recently became accessible through the web-based edition of Google Drive, too. And on Android, it’s now possible to search for files in Drive from Google’s native search app: just say “OK, Google — search for holiday letter on Drive” or some such to get to your files without opening the app and typing keywords. The iOS update is available now while its Android counterpart will roll out over the next week or so (an interesting decision, to say the least). The 50-megabyte universal app requires iOS 7.0 or later. Download Google Drive free in the App Store.